As of March 2016 BML is no longer in business for aquarium lighting. BML have closed shop and are solely providing lighting to horticulture. A well overdue review is the Tropical Marine Centre (Center) AAP AquaRay LED line and the Build My LED line. This review is done by AAP- Aquarium Research in favor of TMC. For a moment, we are going to steer from Marine LED study, to review two of the more popular LED brands on the market of 2016. TMC AquaRay is a professional aquatic brand from the UK, which supplies a high standard equipment and livestock. In the UK, they are the leader for equipment and supply most all stores with premium livestock. TMC is a household name for the UK. They are imported to the US, through a another major livestock supplier Quality Marine in LA,CA, who are also known for only carrying the highest grade equipment and livestock. In 2007, TMC came out with the AAP AquaRay LED line, which for it’s time was the ONLY LEDs to be able to keep high tech reef aquariums and hard to grow plants. There was a few LED brands, which came out at this time, but TMC was the highest standard with the best quality and best growth from the new technology of these light emitting diodes. AquaRay is still the leaders for aquarium LED tech, still to this day of 2016. We will get into the details of this in a moment. Build My LED is a relative newer company as of 2013, with a great concept of being able to build any type of LED fixture someone would need for any type of aquarium. They solely import LED parts and manufacture them in the USA. As of late, they have become a USA household name in the aquatic community, mostly in part, because of the number of conventions they attend and speak at, and because of the neat concept of letting someone build their own type of LED. They also have pre-set LEDs fixtures, which they recommend for certain types of aquariums. Since they have so many combinations of LEDs someone could get, we will be reviewing only one of their more common fixture, which is comparable to AquaRay. For this post, we will mostly be focusing on their planted tank fixtures, as there’s some very good points to be made. For the longest time in planted tank history, what was proven and the standard was to have a 6500 Kelvin lighting system, which always showed to have the best growth. 6500K is high noon white sunlight, plus blue sky. This is a pure white light, which if we looked at the spectrum would have a good amount of high growth blue light, plus all the important full spectrum light all the way down to red. Plant science has shown blue and red to be the most effective plant growing light, when in combo to make a white light. White light is made up of all light color, just like black paint is made up of all colors of paint. AAP AquaRay has two types of planted tank fixtures. 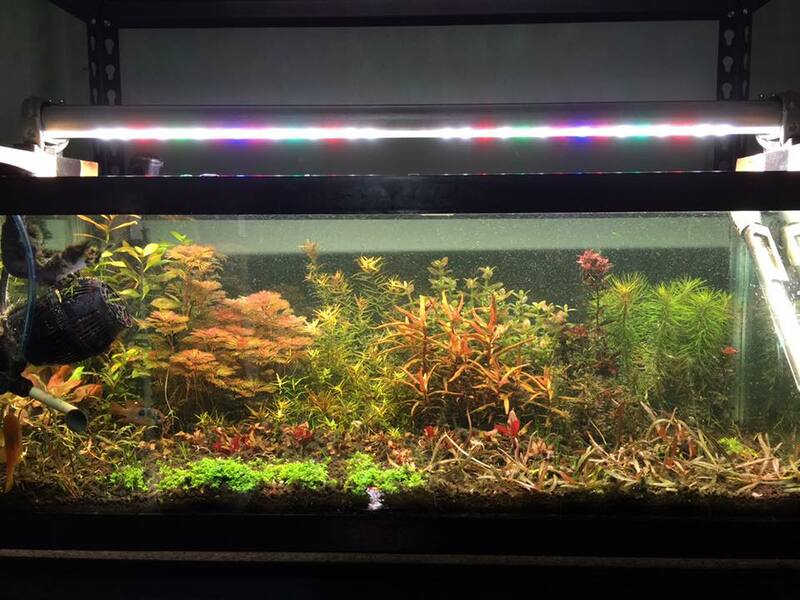 The 6500K planted and the ColourPlus (color) LED, which has white emitters, plus added blue, green, and red. These lights, come in square type fixtures, which provide a highlight spread from the front to back of the aquarium. They also come in a strip fixture, which is a narrower, but longer spread for great length penetration. AquaRay is a modular system, meaning they have many fixtures to allow someone to pick what’s best for their tanks, depending on what’s growing and the dimensions, including depth. Just one fixture is a 10K model, which is best used for aquariums over 30 inch in depth. The 6500K xb-d Cree emitters in fixtures are completely licensed, meaning no other LEDs can get these emitters, because TMC has a special agreement with Cree to only sell these emitters to them. All other brands have binned emitters, meaning anyone can get them. The emitters are ran at 700mA, which is a much faster force these emitters are designed to be ran out. Many brands will run emitters at something like 350mA, to make sure the emitters last as long as they can, with much less force driving them. These xb-d emitters also allow for a little more voltage swings the emitters can handle, because over time, moisture gets into the fixtures and cause voltage to vary. The ColorPlus fixture has the added blue, green, and red emitters meant to pop plant leaf and fish color. These added colors do not add much extra growth to plants, but do help with extra unnatural colors, which has become a fancy trend of late. The 6500K has intense green color, with more natural reds. TMC claims to have the highest output useable energy for input energy of any other fixtures. With just 12 or 30 watts, they can easily outperform 100 watt fixtures. Test with even 175 MH fixtures, the 12 watts fixtures were able to provide better growth. The units also have no fan, which is not needed, because of the amount of emitters used on the heatsink, which also keeps the fixture completely waterproof. LEDs are like fancy computers we put over an aquarium. Moisture and electronics don’t mix long term. They have nice shimmer effect, like the Sun and MH, due to how intense the light is delivered to the aquarium, plus how much light goes actually into the aquarium and does spill over rim. On top of the licensed emitters, AquaRay have a fully waterproof design of IP67, which is the best on the market. They could fall into the water and sit there long term and still come out working with no problem. TMC also provides the longest warranty for any LED of 5 years, full replacement, with any defect, no questions asked. Their support is handled through the US for US customers and the UK for all other customers. There’s usually quick turn around options, so the aquarium does not go a long time without light. The LEDs do require a separate controller for any fancy features like dimming, storm, ramp up and down, moonlight. The controller is ran off a PWM tech, which any LED are required to be dimmed by for long term preservation of the emitters. This is different for the reason, all over fixtures use a 0-10v dimming system, which is not best for emitters long term. They come with in hood mounts and have a separate patented modular mounting design, which allows positioning of the LEDs up or down, left or right depending one requirements of the tank. Build My LED has endless combination of planted tank options and really allows their users to choose what they want to provided to their tanks. Like was said, they have pre-set models, which they recommend and do have different warranties than the custom models. These combinations would be recommended over a user making any combination they want, as these combos have been proven the best for growth and coloration. The build site really allows user to target what kind of planted tank they want and users select, based on coloration and wither the tank is low tech (lower, less light required) to the highest tech tanks, which require lots of Co2 and fert supplements. On the site, anyone can see roughly how much light they are getting, along with spectrums, and a number of other somewhat useful values. They really have a number of pre-sets and user controls, even when aquatic history have proven what’s best for plant health, growth, and most aquatic keepers preference. Still, they give control to the aquarium keeper, which has to be noted as a positive. The fixtures all come in a strip fashion, which mount on each side of the tank. The tank mount and swivel to direct like where it’s needed. The fixture has a 6500K combined rating, with (10) of the emitters being 5000K no name cool white, (2) 450nm no name Royal Blue, (1) 470nm no name Blue, (1) 590nm no name Amber, and (1) 625nm no name Red. US made, built to order, industrial quaility, with no fans. They have an IP66 spray protection rating. Meaning they can get wet, but should never be submerged. They claim to have no disco shimmer effect and should have no hot spots, with the angle emitters they use. They have a separate 0-10v dimmer they use, which is compatible with other popular dimming tech out, like the common Apex. These cannot be dimmed via PWM. As PWM units cannot be dimmed on 0-10v. They come with a 3 year limited warranty, with a 15% of emitters having to fail, before the warranty can be claimed. The unit is then sent in for repair. Rim mounts included, with a separate suspension options sold. Here’s a quick review to sum up this article. I’m a fan of both companies, but one company does have some more benefits, which, I’ve already laid out above. But here’s to make it clearer. AquaRay has been around as the standard for a long time. They are backed by some very large aquatic companies and many professionals. AquaRay works through aquatic professionals, Build My LED works much more through hobbyist. AquaRay has licensed emitters, which no one, including BML cannot get. They are the Cree 6500K xb-d’s. BML doesn’t claim what emitters they use, but do have xb in the title of some of their fixture, which someone can assume are the Cree xbs, just not the 6500K models and this is only assuming from their name of the fixture (Nature Style 6500K xb) as they don’t state what emitters they use. There is also some claims BML does have a patent on some lens of their fixture, but this information cannot be found anywhere. One major difference is using one spectrum of emitters throughout the whole fixture, while BML combines colors to make and overall 6500K rating. There is a major argument here, which could be had for which is better. One is natural white lighting. The other is colors combined, and the colors are expected to blend once the light hits the water. The extra colors do make extra pop to the colors, which is not natural to the eye, but is preferred by many. The pure 6500K spectrum is a nice white, which is what we see and is shined in to the tanks and through out the room if the keeper does not have a hood. The combined color of the BML 6500K is not 6500 white to the eye. It’s actually more blue and pinks, which can be seen from the specs, because they actually use colors more rated for reef keeping, not really what plant keepers have ever used in the past with fluorescent lighting. These colors are what would be seen in a room, if the aquarist does not have a hood. The difference would be a white shimmer on the wall versus a rainbow shimmer on the wall. Someone could say… well then, I will just make a straight 6500K fixture from BML, but then the argument has to be made, why not just go with AquaRay, as their 6500K are patented, which BML are not. Plus AquaRay will provide so many more design perks over BML. Someone could say they prefer the extra color to the tank and no one could argue this point. This would just be preference, because in the last 50 years of aquatic keeping 6500K has always been the standard and there’s also proven health benefits to fish and plants with this pure white spectrum. BML motos has been for people to get what looks best visually to them though, and not necessary what’s best for the plants. This is harder to measure though. Still, AquaRay has a ColorPlus tile, with all the added perks of the tech design, just TMC is not going to tell us that’s what best for the plants. It’s only a preference choice. The AquaRay will use 5 HO 700mA emitters, while the BML use 15 350mA emitters. AquaRay dim using the known way emitters are suppose to be dimmed for long term use of PWM. BML uses the questionable 0-10v. So even though they market that they choose to use 350mA to make the emitters last as long as they can, they then make use of a dimming process, which is known to short out emitters prematurely. One of the major things said about BML in the planted hobby is that the xb fixtures are actually too bright for most aquarist and a dimmer is required, even when injecting tons of co2 and ferts. So, this is actually a waste in the sense, because more light than needed is being purchased, then a extra dimmer is required, which runs the risk of shorting the life of the fixture. TMC has been provided to have the right about of light right out of the box, not requiring a dimmer from the start. This is the difference in using 5 xb emitters vs. 15 xb emitters. Also with the extra stress 0-10v dimming, this is stress over 15 emitters, instead of 5, meaning there’s more percent of change of failure. The 0-10v dimming is much less expensive, if wanted. PWM will cost more upfront, but usually pays for itself, because the energy used is proportionate to the percent of light dimmed to. This is not the same as 0-10v, because even at the lowest setting, full power is still used. AquaRay is completely water proof, while BML is only splash proof. This is huge, as aquatic keeping involves high humidity. It’s a guarantee that moisture will get in and slowly destroy the electronics of these computers over the aquarium. Waterproof will certainly provide the longest life for the emitters possible. The AquaRay come in square spread, which is huge for plant keepers. They also come in strips if need be, even these strips have wide spread. The BML do allow to choose what spread is used, so the widest angle is recommended and since the fixtures have extra power anyways, this will not under light the aquarium in any ways. Lastly, no one can argue the warranty difference between the two fixtures. BML is one of the longest on the market with 3 years, which beat out most competition. They cannot beat out AquaRay 5 year warranty, with full replacement, even with the latest tech, while BML require 15% for the emitters to have to be faulty and then the fixture has to be sent back for repair. So, while both companies provide an LED fixture, which beat out 90% of the competition out there for planted tank LEDs. AquaRay is still clearly setting the standard for aquarium lighting. This article just went into planted tank LEDs at that. BML has a wide range for reef tank options, but they also do not have the patient reef emitters TMC has. Which are the most advanced emitters out period. This article is met to point out, that while new aquarist are seeing from others that BML is the standard for aquarium LEDs, this is mostly do to the fantastic job they’ve done for marketing in the US to mass hobbyists. They promote in the large forums, groups, and conferences. They really have done a grand job in the last 2 years. TMC has just choose to do all their marketing in the UK, where they are already a household name, plus they work with aquatic professionals, which aquatic history shows, that’s what every great aquatic company has done. They’ve always worked through the professionals to help promote and educate hobbyist the right way. Just like drugs from doctors, but now a days, we are seeing commercials for drugs, which bypass the professionals and try to make the general public think they need a certain medication, instead of their doctor telling them what they need based on knowing the history of the person and experience if what they know works. I think this article clearly lays out why AAP AqauRay is still the number one aquatic LED brand as of 2016 and will still set standards as time goes on.